I spent all day yesterday packing and preparing to move, which is what I’ll be doing for the next few days. I’ll be in transit (from one city to the next) for a little bit, so I thought this would be a good time to share another one of the papers I wrote. This one was for a class called: “Proseminar in Somatic Psychology.” In today’s post, we’ll look at the introduction and talk about ‘fishing’ in the context of metaskills. This paper will give a brief summary of metaskills, followed by what is proposed to be the metaskill present during individual therapy, couples’ therapy, and group therapy – fishing. There will be examples of fishing in the three kinds of therapy to support this idea. There will also be implications for possible research of fishing as it relates to mindfulness, transpersonal psychology, and massage therapy. In the proceeding section, there will be an explanation of metaskills. One of the central metaskills is “fishing” (Mindell, 1995). Fishing is the fluctuation between “diffuse, unhurried attention” and “precise awareness” (Mindell, 1995, p. 112). It is very similar to how one would fish on a lake. The person fishing casts a line into the water and then uses ‘diffuse, unhurried attention’ to wait for a fish to bite the line. Once the fish has bitten the line, the person fishing uses a ‘precise awareness’ to reel in the fish. In therapy, the client may be rambling on about something that is not important to follow deeply, until the client reveals the ‘fish.’ The fish could be a somatic response, in that it is something displayed by the client’s body, or it could be something the client says. Mainly, the fish is something presented by the client that is incongruent with their current state of being. When the client reveals the fish, this is where the therapist must use the skill. One potential example of a fish could be the client talking about their grandmother who had recently died. As the client is talking more about their grandmother’s death, the therapist notices movement by the client’s body when they speak about death. It does not have to be a grandiose expression, but just a subtle twitch or movement that seems to contrast with the client’s way of being. The movement is not exaggerated, but quite subtle. The movement could be a slight tension in the client’s shoulders. Specifically, when the client mentions the word death, the therapist notices that the client’s shoulders tighten and rise up ever so slightly. At this point, the therapist could check the line to see if there is a fish. That is, the therapist might stop the client and ask them more about death, to see if what the therapist thought was a fish, really was a fish. Even if what the therapist thought to be a fish turns out not to be a fish, that is part of the metaskill of fishing. There are times when there might appear to be a fish, both on the lake and in therapy, and it is appropriate to check and see if there is a fish. 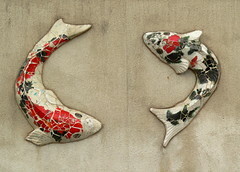 In order to know if there is a fish on the end of the line, the therapist must listen to the feedback from the client. The client could give the therapist negative feedback, which is when the client’s responses to the therapist’s tests indicate that there is not a fish. The client could also give the therapist positive feedback, which is when the client’s responses to the therapist’s tests indicate that there is a fish. There has been a thorough explanation of fishing. In the following section, fishing will be tied to therapy. Check back tomorrow for the next section: fishing as a therapeutic skill. This entry was posted in Education, Health, Psychology and tagged Cognitive behavioral therapy, Counseling Services, Fish, Massage, Mental health, Psychotherapy, Sofia University, Somatic Psychology, Therapeutic, Therapy. Bookmark the permalink.